This student submission comes from my former student Belle Duran. Her topic, from Pre-Algebra: fractions, decimals, and percents. In the early 17th century, calculating left all remainders in fraction form since the decimal has not been invented yet; this left a lot of redundant calculating for early mathematicians as well as a lot of room for small errors. Napier thought this to be “troublesome to mathematical practice” that he created an early version of a calculator known as Napier’s logarithms (an early appearance of the notorious laziness of mathematicians). They made computing numbers so simple that they became standard for astronomers, mathematicians, and anyone who did extensive computation; except for, of course, the people who had to construct the tables (consisting of over 30,000 numbers). Since it required a lot of computation, Napier resorted to expressing the logarithms in decimals. While Napier did not invent the decimal, he was considered one of the earliest to adopt and promote its use. In 31 BC, ruler of Rome, August, taxed the sales of goods and slaves that were based on fractions of a hundred; trading usually involved large amounts of money that 100 became a common base for mathematical operations (“per cento” is Italian for “of hundred”). From the term, abbreviations were created such as “p 100 oder p cento”. In 1425, an uneducated scribe wrote “pc” and adorned the c with a little loop; from there, the sign evolved to a combination of loop and fraction bar. D5. How have different cultures throughout time used this topic in their society? Dating back to around 1650 B.C., Egyptian mathematicians used unit fractions; they would write five sevenths as 5/7= ½ + 1/7 + 1/14. Also, they did not use the same fraction twice, so they could not write 2/7 as 1/7+1/7, but 2/7=1/4+1/28. In the Middle Ages, a bar over the units digit was used to separate a whole number from its fractional part, the idea deriving from Indian mathematics. It remains in common use as an under bar to superscript digits, such as monetary values. 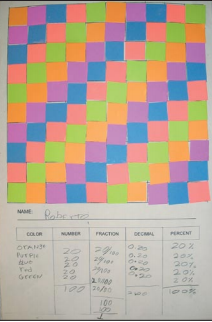 As seen on the image above, when the students were done with their masterpiece, they would have another sheet consisting of columns: color, number, fraction, decimal, and percent. They would list the colors they used under the color column, and then count the amount of squares of each color and record it in the number column. They would then convert the number of each color used compared to the total amount of squares (100) to a fraction, decimal, and percent. To further their understanding, I could ask the students to block out the outer squares and ask to calculate the new number of each color, fraction, decimal, and percent from the new total (64).